Curious about mountain biking? Here are some tips that will get you rolling in no time. Buy a bike that suits you. There are many categories of mountain bikes, each one designed to give you a better riding experience on specific types of terrain. Raleigh offers mountain bikes in the Cross-country, Trail, and Fat bike categories. Cross-country bikes, like the Skarn Sport and Teoka, are oriented more toward pedaling fast uphill than flying down descents. Trail bikes, like the Kodiak and Tokul series, balance efficient pedaling with more confidence-inspiring descending capabilities. Both Cross-country and Trail bikes come in full-suspension and hardtail (front suspension only) varieties. Instead of using suspension, Fat bikes, like the Pardner and Rumson, feature extra-wide tires that can be run at extremely low air pressure to float through deep sand, on top of snow, or over obstacles. 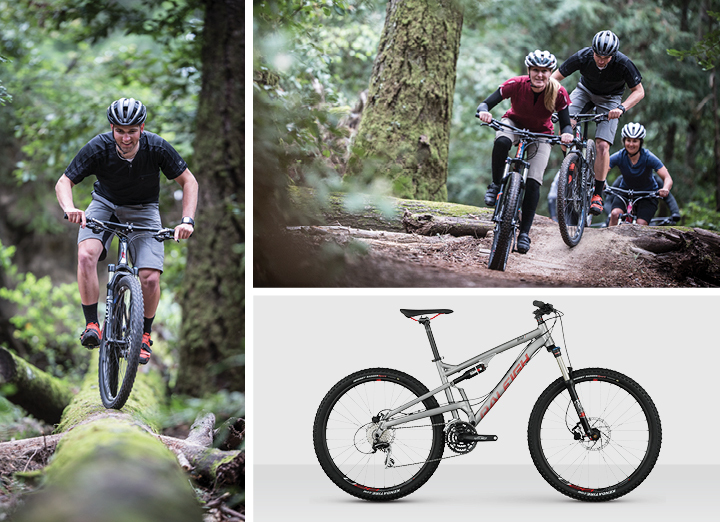 Raleigh also offers women’s-specific mountain bikes — the Ziva and Eva series — which offer a size range and touchpoints more likely to fit women. Take a lesson or two. Sure, you can go out and figure things out on your own or have a friend give you tips and pointers. But there are faster ways to learn. Mountain biking isn’t intuitive for most of us. Dedicate some time and energy to working with a professional coach up front and your skills will be way ahead of where they would have been if you’d simply winged it on your own. Check online or ask your local bike shop or local mountain bike club for recommendations on skills clinics and coaches. You can find one-on-one coaching, group skills classes, and women’s-only camps in many areas. Try features that scare you. One of the only ways you’ll truly get better at riding is to practice the moves that scare you. If it’s something out of your comfort zone, get a friend to help you, demonstrate, and spot for you. You’d be surprised what easing up on the brakes can do for control in a technical descent. Don’t have friends who ride yet? Find a group ride through your local bike shop or mountain bike club. 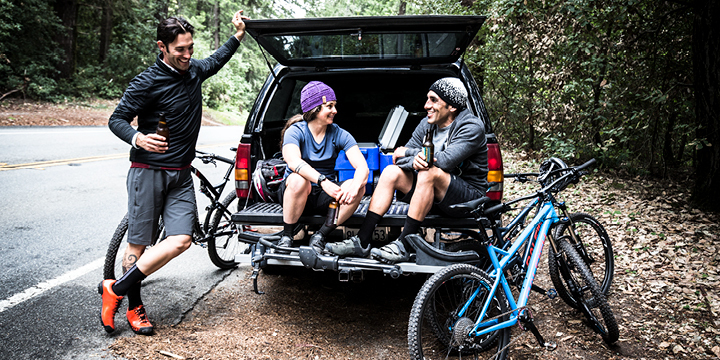 Mountain biking is great on its own, but friends make everything better. Ride with people who are better than you. While you don’t need to ride with people that are way faster and more technically adept on their bikes, it helps to ride with people that are slightly faster. Watch their lines. Try to follow their lead. Watch their body positions. Emulate them. Ask them questions. Chances are they want you to get faster too, because it’s fun to ride in a group, and it’s fun to watch your friends progress. You don’t have to be a racer to appreciate the talents of professional riders. Watching pros snake through tricky sections of a scenic trail can inspire you to get out for that quickie ride after work on Wednesday. There are a lot of reasons we ride. We ride because it’s fun. We ride because it’s an awesome workout, we ride because it feels good to be out in nature, and we ride because it’s a great way to hang out with our friends. Find your reason to pedal, and you’ll fall in love with the sport.